Want to see a day in the life of your local Colonie firehouse? Boght Community Fire District in Colonie, NY, is happy to show off our volunteers and accomplishments. Our Boght community firefighters are proud to be part of and help protect our local community. For more than 74 years, we have been serving the people of Boght Corners, as well as the rest of Colonie and will continue this endeavor for many years to come. Our volunteers are happy to have the support of our local community as well. Browse through the gallery below to see more about our house and the fire services we offer. 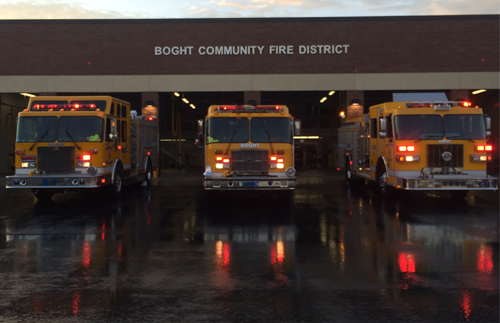 The Boght Community Fire Department is staffed with Professional Firefighters 24 hours a day. Every time we respond to a call for assistance, our apparatus is staffed completely with all Professional Volunteer firefighters. Interested in seeing what it takes? Please stop in on Thursday evenings between 630-900pm for a visit, information and an application. Please take notice that the Annual Election of the Boght Community Fire District will take place on December 11, 2018 between the hours of 6:00 PM and 9:00 PM at the Boght Community Fire House located at 8 Preston Drive in the Town of Colonie, County of Albany and the State of New York for the purpose of electing one (1) Commissioner for a 5-year term commencing on January 1, 2019 and ending on December 31, 2023. Candidates for District Office of Commissioner must file a letter of intent to run with the Secretary/Treasurer of the Fire District no later than November 21, 2018. All residents of the Fire District duly registered with their County Board of Elections as of November 19, 2018 shall be eligible to vote. We are the team you call for any rescue situation. Our Boght Fire Department team is available 24 hours a day to help you. Contact us today to learn more about our firehouse.